John Bannister Goodenough (born 25 July 1922 in Jena, Germany) is an American professor and prominent solid-state physicist. He is currently a professor of mechanical engineering and materials science at The University of Texas at Austin. 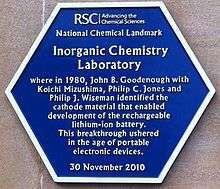 He is widely credited for the identification and development of the Li-ion rechargeable battery as well as for developing the Goodenough-Kanamori rules for determining the sign of the magnetic superexchange in materials. In 2014 he received the Charles Stark Draper Prize for his contributions to the lithium-ion battery. During the late 1970s and early 1980s, he continued his career as head of the Inorganic Chemistry Laboratory at University of Oxford, where he identified and developed LixCoO2 as the cathode material of choice for the Li-ion rechargeable battery that is now ubiquitous in today's portable electronic devices. Although Sony is responsible for the commercialization of the technology, he is widely credited for its original identification and development. He received the Japan Prize in 2001 for his discoveries of the materials critical to the development of lightweight rechargeable batteries. Since 1986, he has been a Professor at The University of Texas at Austin in the departments of Mechanical Engineering and Electrical Engineering. During his tenure there, he has continued his research on ionic conducting solids and electrochemical devices. His group has identified LixFePO4 as a less costly cathode material that is safe for power applications such as machine tools and Hybrid electric vehicles. His group has also identified various promising electrode and electrolyte materials for solid oxide fuel cells. He currently holds the Virginia H. Cockrell Centennial Chair in Engineering. Goodenough still works at the university at age 94, hoping to find another breakthrough in battery technology. On the fundamental side, his research has focused on magnetism (e.g. the Goodenough-Kanamori rules) and on the transition from magnetic-insulator to metallic behavior in transition-metal oxides. On the basis of the Virial Theorem, he recognized that this transition should be first-order and should, where the phase transition occurs at too low a temperature for atomic diffusion, result in lattice instabilities. At this crossover, these instabilities lead to charge-density waves in single-valent oxides and to phase-fluctuations in mixed-valent oxides. The phase fluctuations are responsible for such unusual physical properties as high-temperature superconductivity in copper oxides and a colossal magnetoresistance in manganese and cobalt oxides. Professor Goodenough is a member of the National Academy of Engineering, the National Academy of Sciences, French Academy of Sciences, and the Real Academia de Ciencias Exactas, Físicas y Naturales of Spain. He has authored more than 550 articles, 85 book chapters and reviews, and five books, including two seminal works, Magnetism and the Chemical Bond (1963) and Les oxydes des metaux de transition (1973). Goodenough is a co-recipient of the 2009 Enrico Fermi Award. This presidential award is one of the oldest and most prestigious given by the U.S. government and carries an honorarium of $375,000. He shares the honor with Dr. Siegfried S. Hecker, professor at the Management Science and Engineering Department of Stanford University. In 2010 he was elected a Foreign Member of the Royal Society. On February 1, 2013, Goodenough was presented with the National Medal of Science. The Royal Society of Chemistry grants a John B Goodenough Award in his honour. Lightfoot, P.; Pei, S. Y.; Jorgensen, J. D.; Manthiram, A.; Tang, X. X. & J. B. Goodenough. "Excess Oxygen Defects in Layered Cuprates", Argonne National Laboratory, The University of Texas-Austin, Materials Science Laboratory United States Department of Energy, National Science Foundation, (September 1990). Argyriou, D. N.; Mitchell, J. F.; Chmaissem, O.; Short, S.; Jorgensen, J. D. & J. B. Goodenough. "Sign Reversal of the Mn-O Bond Compressibility in La1.2Sr1.8Mn2O7 Below TC: Exchange Striction in the Ferromagnetic State", Argonne National Laboratory, The University of Texas-Austin, Center for Material Science and Engineering United States Department of Energy, National Science Foundation, Welch Foundation, (March 1997). Goodenough, J. B.; Abruna, H. D. & M. V. Buchanan. "Basic Research Needs for Electrical Energy Storage. Report of the Basic Energy Sciences Workshop on Electrical Energy Storage, April 2-4, 2007", United States Department of Energy, (April 4, 2007). ↑ Thackeray, M. M.; David, W. I. F.; Bruce, P. G.; Goodenough, J. B. (1983). "Lithium insertion into manganese spinels". Materials Research Bulletin. 18 (4): 461–472. doi:10.1016/0025-5408(83)90138-1. ↑ Charles Stark Draper Prize News, National Academy of Engineering. Retrieved March 1, 2015. ↑ LeVine, Steve (5 February 2015). "The man who brought us the lithium-ion battery at the age of 57 has an idea for a new one at 92". Quartz (publication). Atlantic Media Company. Retrieved 5 February 2015. ↑ Goodenough, John B. (2008). Witness to Grace. PublishAmerica. ISBN 9781462607570. ↑ Henderson, Jim (June 5, 2004). "UT professor, 81, is mired in patent lawsuit". Houston Chronicle. Retrieved August 26, 2011. ↑ LeVine, Steve (5 February 2015). "The man who brought us the lithium-ion battery at the age of 57 has an idea for a new one at 92". Quartz. Archived from the original on 5 March 2016. ↑ "Obama honors recipients of science, innovation and technology medals". CBS. Retrieved 2013-03-09. ↑ "Royal Society of Chemistry - John B Goodenough Award". Royal Society of Chemistry. Retrieved 20 January 2015. "John B. Goodenough". Faculty. The University of Texas at Austin Mechanical Engineering Department. May 3, 2005. Archived from the original on September 28, 2011. Retrieved 2011-08-23. John B. Goodenough (1963). Magnetism and the Chemical Bond. Interscience-Wiley, New York. ISBN 0-88275-384-3. John B. Goodenough (1973). Les oxydes des métaux de transition. Gauthier-Villers, Paris. John B. Goodenough, ed. (2001). Structure & Bonding, V. 98. John B. Goodenough (2004). "Electronic and ionic transport properties and other physical aspects of perovskites". Rep. Prog. Phys. 67 (11): 1915–1973. Bibcode:2004RPPh...67.1915G. doi:10.1088/0034-4885/67/11/R01. K. Mizushima; P.C. Jones; P.J. Wiseman; J.B. Goodenough (1980). "LixCoO2 (0<x<-1): A new cathode material for batteries of high energy density". Mater. Res. Bull. 15 (6): 783–799. doi:10.1016/0025-5408(80)90012-4. John B. Goodenough (1985). B. Schuman, Jr.; et al., eds. "Manganese Oxides as Battery Cathodes". Proceedings Symposium on Manganese Dioxide Electrode: Theory and Practice for Electrochemical Applications. Re Electrochem. Soc. Inc, N.J. 85–4: 77–96. A.K. Padhi; K.S. Nanjundaswamy; J.B. Goodenough (1997). "Phospho-Olivines as Positive Electrode Materials for Rechargeable Lithium Batteries". J. Electrochem. Soc. 144 (4): 1188–1194. doi:10.1149/1.1837571. John B. Goodenough (1955). "Theory of the role of covalence in the Perovskite-type Manganites". Phys. Rev. 100: 564–573. doi:10.1103/physrev.100.564. John N. Lalena; David A. Cleary (2005). Principles of Inorganic Materials Design. Wiley-Intersciece. pp. xi–xiv, 233–269. ISBN 0-471-43418-3.